For the past 12 months I have been mining the regional archive for treasures we’ll exhibit when the MTG opens in September 2013. Amongst the archive’s weightier objects, I’ve discovered some delightful gems including a printed advertisement made in 1922 for a black and white silent film directed by Horace Spence Cottrell, a member of Napier’s Thirty Thousand Club. 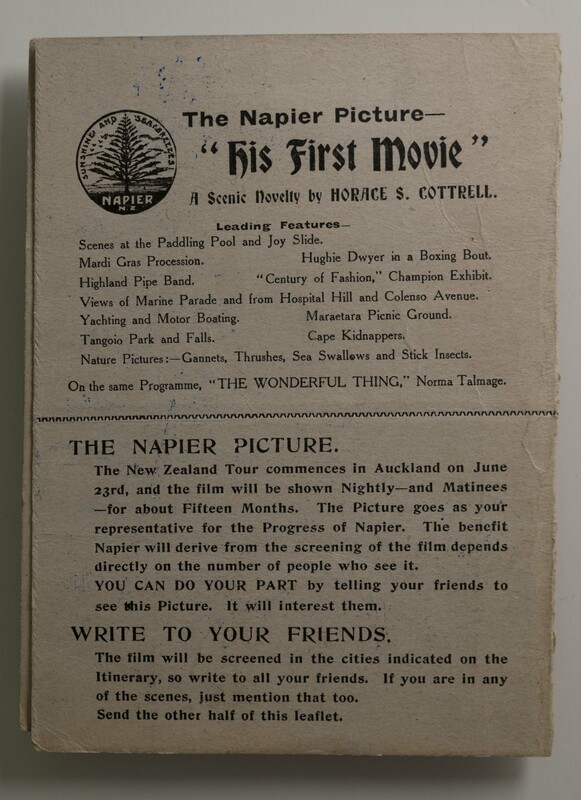 Cottrell’s film His First Movie: a scenic novelty was part of The Club’s campaign to show New Zealand and the world that Napier – ‘Bright, Breezy, and Beautiful’ – was ‘an ideal spot in which to live; excellent in its health records, municipal enterprise, scholastic organisations and for its natural beauty of situation, which has gained for it the reputation of being the Nice of the South.’ By promoting Napier as a seaside resort, the Club aimed to attract new residents. If the population reached 30,000, the town would become a city; a larger population would support local industry and spur Napier’s progress. The pool at Napier is tremendously popular with the kiddies. It was necessary to film this spot at 10.30am, but the crowds of children do not usually arrive ‘til about noon. So we advertised: ‘Boys and girls who wish to act for a moving picture at the paddling pool are invited to be on location at 10.30 Saturday morning.’ They came – five hundred of them – and each one expected to be treated to a close-up! Despite a few bloopers, Cottrell was clearly proud of his film. Printed on a small, unassuming foldout card, his ad informed the people of Napier that His First Movie would tour New Zealand for 15 months. Moviegoers from Auckland to Invercargill would all have the opportunity to see Napier star on the big screen. ‘This picture goes as your representative for the progress of Napier,’ Cottrell wrote in his advertisement, ‘do your part, tell your friends to see it. ’ Profits from ticket sales would fund a merry-go-round on Marine Parade. Cottrell’s ad and the film itself, the latter sourced from the New Zealand Film Archive, will be on display in the MTG’s new exhibition Take these with you when you leave: treasures of the archive opening in September 2013. “Goals of the club: NAPIER’S 30,000 CLUB,” Poverty Bay Herald, Volume XXXIX, Issue 12922, 16 November 1912, 2. “His First Move: Amazing Experiences in Hawke’s Bay,” The NZ Theatre and Motion Picture Magazine, 1 August 1922, 14.